Thanksgiving is my favorite holiday. Here in Kenya though, it is just another working day. We and the other missionaries and Americans celebrated on Sunday afternoon. We had decorations and the doxology, conversations and casserole, pie and a puzzle. Loved it! Even before the celebration, it was a memorable day. I was amazed at church as chairs were brought in time and time again. First, they filled from the normal back row to the wall. Next a row was put in place in front of the front row and the aisles were narrowed. People were still standing at the door. I turned around and noticed the associate pastors on top of the office area at the back of the church. I had n’t even known this balcony area existed. Still people stood. When the children were released for their service, all the adults had a seat. Amazing. On Monday, Greg gave the devotional at the 8 a.m. chapel time for the students in the school based program. His message was, “Fulfill your calling, but in the power of the Holy Spirit just as Jesus did after his time of testing in the desert” – from Luke 4. Other shots from this week… The cat is for my daughter-in-law. (Oh, how I love writing that!) We have about four cats that live on campus. Being involved as faculty/staff at ANU is a rewarding but often intense job for Amy and me. We treasure the chances we have to get off campus and recreate. This afternoon was one of those times. 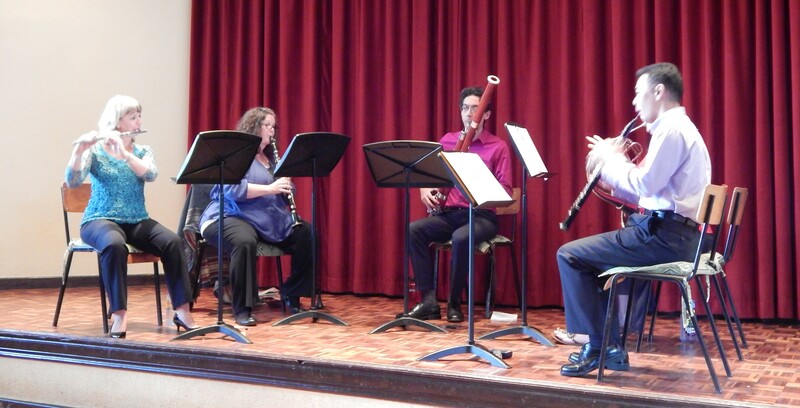 The Nairobi Music Society sponsored a concert by “Equatorial Winds,” a quintet including flute, oboe, clarinet, bassoon, and French horn. Their 90-minute program included rousing pieces from Franz Danzi, Anton Piazolla and Antoine Joseph Reicha. In the group, three nations were represented (the U.S., U.K. and Japan). Nairobi is a real musical crossroads. In two weeks, I’ll be singing tenor at the Christmas concerts for the Nairobi chorale. I attend rehearsal every Tuesday night. My soul soaks up the beauty that choir music gives me and I always come back refreshed. Teachers work hard. Teachers in Kenya are no exception. Due to several variables in the past, many people had been allowed to teach, particularly at the primary level, without a bachelor’s degree. A few years ago, the government decided that this must change. A limited time was allowed for people to upgrade to a degree level education. ANU took the challenge to educate those already teaching by offering courses during school vacation periods. Now, the students who come for the “school-based” program are not only getting education degrees. Many courses are given and several of those teachers who came originally for a bachelor’s have obtained a master’s degree. The school-based students’ day begins with chapel. It is great when these students are on campus. They give a different feel. They are older. They are hungry for education. They are intentional in studies and faith. University Church of the Nazarene was so packed out on Sunday that the people who gave announcements found their seats had been quickly filled when they were on the platform. Children were on the laps of nearby adults and extra chairs were placed in the aisles. When you think of vacation, do you think of taking classes? Do you cram your days with worship and learning? These students do. Author croffordsinkenyaPosted on November 16, 2016 Categories Words and a picTags adult education, school-based, vacationLeave a comment on School vacation? Hardly! 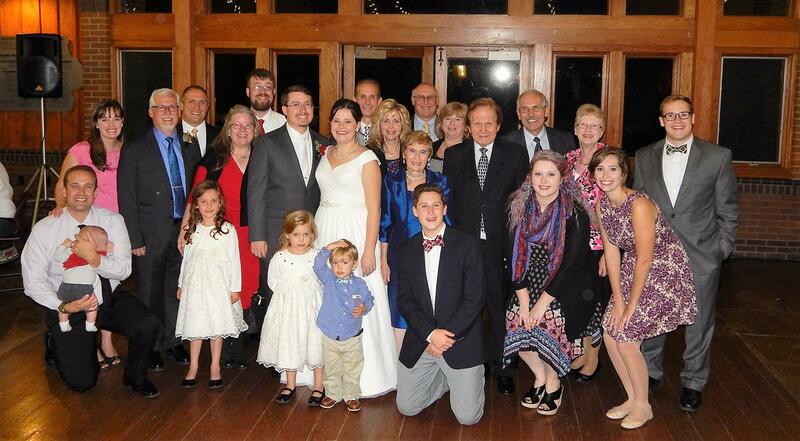 On Friday, November 4, our younger son, Brad, married Emily (Em) Papp. We flew from Nairobi to Des Moines, Iowa for the celebration. In the days leading up to the wedding, we had time as a family, including John, who came all the way from S. Korea to be the best man. It was the first time the four of us had been together in over 3 years. Now, we’re thrilled that it will be the five of us, as we welcomed Em to our family. It was also fun getting to know Em’s mom, Amy, and some of the the family on her side. A lot of the Crofford extended family came for the wedding ceremony and reception. Greg’s dad and mom were there, as were four of Greg’s brothers, their spouses, and some of their children and grandchildren. Amy’s sister, Meg, her husband, Dan, and their children also came. We’re safely back at ANU now, after 1 1/2 days of return travel. Our bodies are tired, but our hearts are overflowing! Greg and I are visiting all of our favorite haunts from the last time that we lived in Nairobi. A week or so ago, we visited Yaya Centre. The Indian restaurant has changed its menu. Unfortunately, all our favorite dishes were casualties. We went to Java House instead and discovered that they now have really good (and spicy) burritos. Win! While at Yaya, we also visited the music store, the craft store, the toy store, and the souvenir shop none of which had changed much in the past three years. I was reminded of how expensive embroidery kits are here. A small one cost almost $50 USD. That’s not happening. I wil l design my own. We saved our favorite store for last… BookStop, Ltd.. As if we need to be told to stop for books! It sells new books, but also used books at prices that are not garage-sale-cheap, but also not outrageous. While I was perusing the used books, Greg meandered around the rest of the store. Then, he signaled me to come over to where he was. He held up a book and said, “She’s famous!” He then snapped the pictures in this post. Prof Leah Marangu is well respected beyond the campus of Africa Nazarene University. It is an honor to serve under her leadership. We are looking forward to the Commencement ceremonies on Friday. Please, say a prayer for all of us as the day will be glorious, but hectic as (I believe) ANU graduates a record number of students… again! Just who is the Great Commission for? Rev Evans Katanga kneels as we pray for him. Njeri could not attend. Is the Great Commission – or the “Supreme Order,” as the French say – for all followers of Christ everywhere? Ask Reverend Evans and Njeri Katanga. Evans grew up in the Church of the Nazarene in Harare, Zimbabwe. Some years ago, he sensed that God was calling him to cross-cultural ministry. 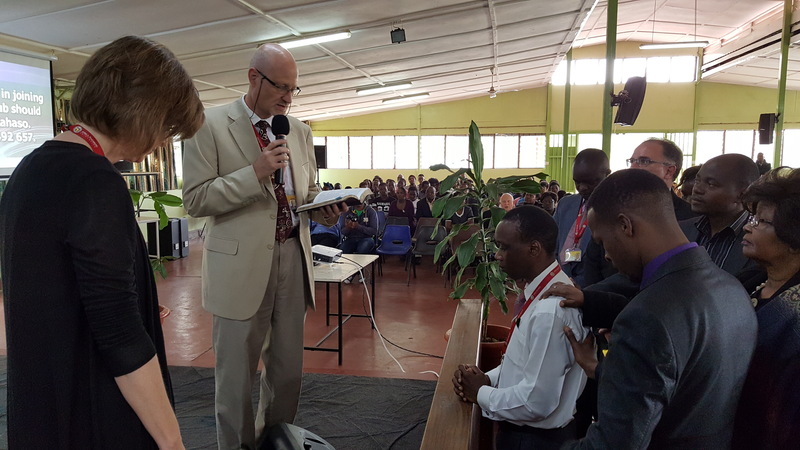 His journey took him to Kenya, where he enrolled at Africa Nazarene University outside Nairobi. In 2011, he married Njeri, and the Lord has given them a daughter, Panache. Now Njeri senses as well that she is called of God to be a missionary. In January 2017, Global Mission is deploying the Katanga family to Accra, Ghana, where they will work alongside our Nazarenes with a focus on theological education. Meanwhile, they are beginning deputation services in Kenya, Zimbabwe, and South Africa. Yesterday at chapel, Evans – who has been serving as Dean of Students for our ANU Town Campus – shared about their journey and asked us to pray for and support them. At the end, Professor Reed invited us to gather around and pray – see photo. What a wonderful time of affirming God’s call on the life of this family! Will you join me in praying for them as they follow God’s leading to a place far away from their Zimbabwean and Kenyan roots? Where God leads, He will sustain. Author croffordsinkenyaPosted on October 5, 2016 Categories Words and a picLeave a comment on Just who is the Great Commission for? 10 – You greet campus security and others as you pass by them saying “Habari” and they reply “Nzuri sana” with a smile. 9- The ladies at the campus library cheer when you reply “Nzuri sana” to their greeting to you. 7-You pick up isolated words from conversations as you pass by groups of people… kesho (tomorrow), leo (today), sawasawa (okay), pole sana (so sorry), and so on. 4- You borrow a well used Swahili grammar book from the library. Language learning is work. 3- You are gently corrected by the guy manning the desk in the hallway. (I said “Siku njema” (Have a good day). Since it was a Friday evening, he said I should say, “Wikendi njema” (Have a good weekend). Bonus pictures – The baboons were in the back yard this morning. This one thinks the light pole is as good as the crook of a tree and the other is completely at ease walking on the barbed wire fence.